Having a catch up since my last blog. I don’t do kindness to my self very well as I’m more happier being kind to others, so thought I’d give it a go. 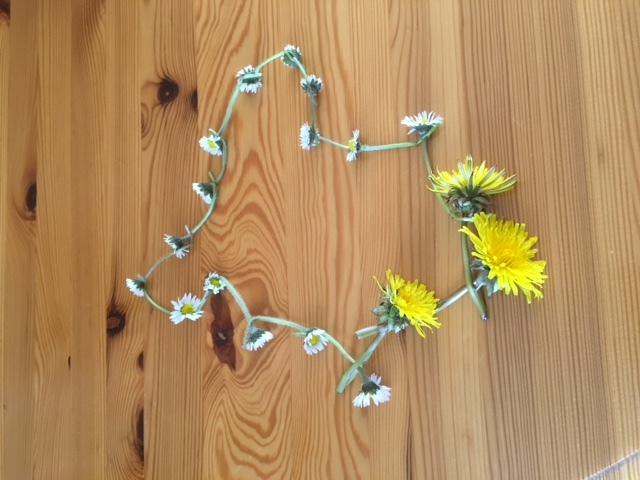 Unfortunately, had some sad news on Wednesday so that didn’t happen apart from family and friends being kind to me like the daisy/dandelion necklace made for me at work. It hasn’t stopped me doing the daily challenges as focusing on something else has helped me through the last few days – it’s just taken till now to write about them. Also just about finished writing my letters to some special people. I’ve had a good laugh listening to Sally on Sunday as I fully agree about decluttering and the feeling it gives you when you finally let go of things is amazing. Had a big declutter a few weeks ago was so proud of the space I had made until I realized I’d throwing my daughters car keys away, unfortunately she only had one set – oops. Will declutter with caution this week. Oh no, Lesley! That’s so annoying about the car keys. But glad you’re able to still see the joy and freedom in decluttering. I definitely am overdue a big clear out (with caution). How did your letter writing go? I’m sorry for your sad news. It’s wonderful to hear that you have kind friends and family that are with you when you need them most. It may feel hard but now is the perfect time to make sure that you’re kind to yourself – even if it’s just you saying to yourself “it’s ok to feel sad”.